After 10 years of on the job exposure in Islamic Banking and Finance, I decided to get formal qualification on the subject. 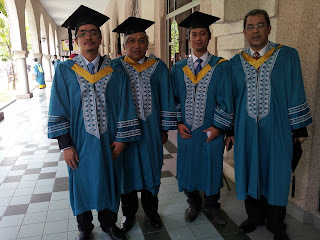 I enrolled as part time student at International Islamic University of Malaysia. I was very lucky to have course mates from various background and specializations as well as from various parts of the world. There were lawyers, bankers, central bankers, academicians, and many more. I was very lucky to have Datuk Muhammad Ibrahim (at that time still a Bank Negara Malaysia Assistant Governor) as one of my course mates. We graduated on the same day in October 2012. Seen in this pic right to left is yours truly, Datuk Muhamad Ibrahim (BNM Governor), brother Yono from central bank of Indonesia and brother Zahid (one of Islamic banking pioneers in Malaysia).